Did you know in the original Wizard of Oz books Dorothy’s slippers were silver? But on the silver screen, the director sought bright red ruby slippers to update Dorothy’s wardrobe and show off colored film for the first time. In the modern age, Bel Air Jewelry in Los Angeles puts it good foot forward (no matter what the shoe) and wears the birthstone of July on more accessories than ever! 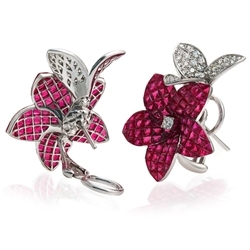 Flowers and rubies have one thing in common: when exposed to certain light they become more beautiful. Morning glories may look wilted at night, but their petals blossom when exposed to sunlight. Find the hottest ruby and under ultraviolet light it’ll absorb the radiant light and emit its own light called florescence. How strong or what color the light reveals the ruby’s origins. 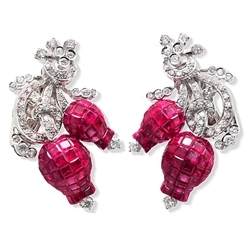 In nature these Ruby and Diamond Floral Earrings are the best of both words: flora and florescence. We may not have the Liberty Bell Ruby, which is at large due to a heist and the largest ruby in the world at 8000 carats, but what we have is available here: these beautiful bell-shaped Ruby and Diamond Tulip Earrings on White Gold. Consider yourself worldly in just one pair of earrings. The tulips are the national flower of the Netherlands, the diamonds are French-cut, and the rubies are mined in Asia, Africa, even the Americas. Is there anywhere we missed besides Antarctica? Ruby itself is a gemstone with worldly origins. Rubies once traveled the Silk Road, were discovered by Europeans, sailed the Atlantic, and headed west to be worn in Los Angeles. An ruby with that very itinerary could be waiting for you at Bel Air Jewelry. 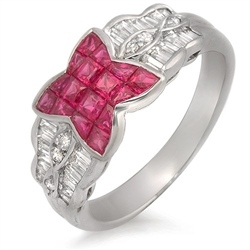 This Ruby and Diamond Ring has qualities of a fantasy world with its harmonious combination of fairy and butterfly wing designs. There’s only one place on Earth you can find the most beautiful classic and modern designs: Bel Air Jewelry. From the Golden Age of Hollywood to the modern age, specifically in the month of July, ruby remains timeless and the hottest precious gemstone. Just ask the Wicked Witch of the West.